The New Year 2015 welcomes in a new Alitalia as Alitalia CAI becomes Alitalia SAI on 01-Jan-2015, having completed an ownership change in which Abu Dhabi's Etihad Airways takes a 49% stake, adding to its investments in other European carriers including Aer Lingus, Air Serbia, airberlin and Darwin/Etihad Regional. But 2015 will also witness a record amount of seats offered between Italy and Gulf hubs as Alitalia and Etihad grow flights to Abu Dhabi under their partnership, while Emirates and Qatar make their own additions. There will be approximately 1,200 more seats a day between Italy and the Gulf in 2015 compared to 2014, for a total of over 5,100 seats a day. Alitalia and Etihad will add more seats than they have in the past while Emirates and Qatar, so far, will have their highest growth year in Italy since 2012. In the space of four years the Italy-Gulf market will have doubled from 840,000 seats in 2011 to a projected 1.9 million in 2015. The Etihad-Alitalia deal, backed by the Italian Government, received EC approval on the basis only of having to offer slots on the Rome-Belgrade route, which is only flown by Alitalia and Air Serbia, in which Etihad has also invested. The common shareholding and lack of other airlines on the route raised competitive concerns. This is a relatively minor concession. 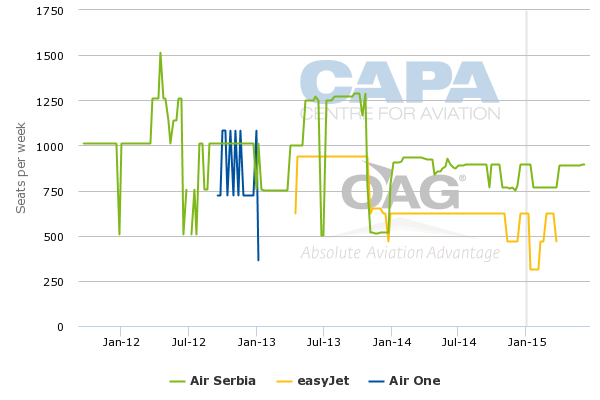 Only Air Serbia and easyJet compete on the Milan-Belgrade route and no slots were known to be given up. There have already been impacts from the Alitalia-Etihad transactions as airberlin and Alitalia commenced a partnership under which airberlin gains access to slots at Milan Linate airport. (i) Etihad wants to boost its presence in Italy, where previously it has lagged Emirates and Qatar Airways. Etihad entered the Italian market only in 2007, well after Emirates and Qatar. In 2014, it had about the same number of seats from the Gulf to Italy as Emirates had in 2005. Its growth in 2014 was 48% compared to the previous year and so far in 2015 will be 36% compared to the previous year. (ii) Alitalia will gain from flying to Etihad's Abu Dhabi hub, where Alitalia can then transfer passengers to/from a range of destinations to which it has not previously had convenient offline access. (Etihad will also codeshare on Alitalia's Abu Dhabi flights.) Alitalia's network east of Europe has been thin and essentially confined to limited Japan services despite the demand from India and Korea, to name but two countries. Alitalia was forced to watch as Gulf, Asian and European carriers carried much Italian traffic. Alitalia will add the second largest number of seats (120,000) to the Italy-Gulf market. (iv) Qatar does not want to be become the smallest player. In past years Qatar has been at least twice the size of Etihad in the Italy-Gulf market, but in 2015 the combined size of Alitalia and Etihad will be just under Qatar's size. The Italy-Gulf market will so far grow 31% in 2015, the third-highest after growth in 2012 (47%) and 2009 (43%). However, the net number of new seats – 448,000 – is a record. Emirates will account for 50% of the growth, Alitalia 27% and about 11% each for Etihad and Qatar. Alitalia and Etihad will add more capacity than any previous year while 2015 will be the second-highest growth year for Emirates and Qatar in terms of net additional seats. The combined growth of Alitalia and Etihad means they will jointly rival Qatar as the third-largest entity in the Italy-Gulf market. At the time of their Aug-2014 partnership announcement, Etihad and Alitalia had flagged Alitalia eventually launching new Abu Dhabi routes to secondary Italian cities like Bologna, Catania and Venice. Alitalia has started that process with a service to Venice. Venice was a natural choice given its far larger size than Bologna or Catania, which have limited international links. Venice already has Gulf service from Emirates and Qatar. In 2015 Venice will account for 13% of Gulf-Italy seats, Rome 45% and Milan 41% (sums may not equal 100 due to rounding). These proportions are similar to the capacity distribution at Emirates and Qatar. Alitalia, which is a newcomer to the market, has a more equal distribution between the markets. With time, additional secondary markets could be launched while it adds more capacity to Milan and Rome. Etihad serves only Milan and Rome and has an equal distribution in 2015, although Rome is still a newer route. Emirates on 01-Dec-2014 up-gauged a 777-300ER service to A380. 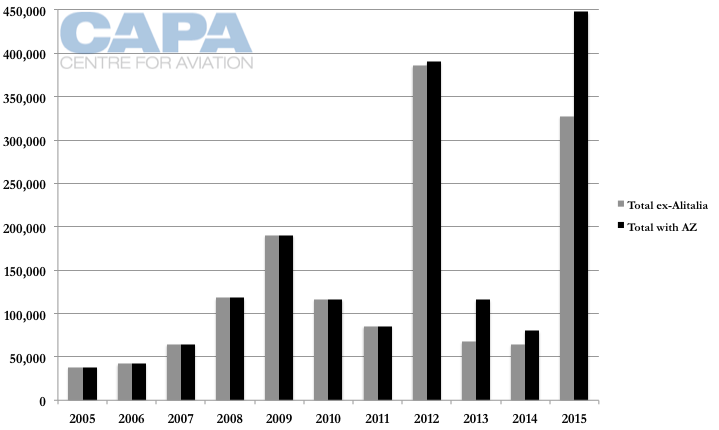 Some capacity changes in 2014 will be reflected in 2015 while some changes in 2015 will not be fully recognised until 2016 (for example, Qatar up-gauges Venice mid-way through 2015). This traffic is coming from and going to a range of points. After their respective home markets, Gulf carriers see a range of destinations, especially at Emirates, which is benefitting from access to Qantas' regional Australian market. The markets vary by carrier but there are themes: Australia, Tokyo and Seoul are popular, as are popular leisure destinations like Bangkok, Mahe, Male and Mauritius. Italy is also a popular destination for Chinese, including those in Hangzhou, which is Qatar's 10th largest connecting market and by some measures the wealthiest area in China. The markets – Middle East, Africa, Asia-Pacific – that Gulf carriers link to Italy over their hubs are a small part of Italy's story. Seats from Italy to Europe and North Africa will comprise about 88% of all international non-stop seats from Italy. But these markets have been under-exploited and hold considerable growth opportunity. 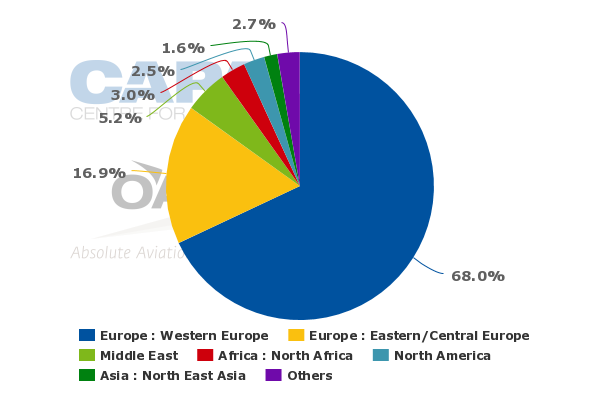 Notably, the Middle East is a larger market from Italy than North America in terms of non-stop flights; Italy has watched helplessly as much of its trans-Atlantic traffic travels over other European hubs. The growth Gulf carriers are planning so far promises to be net growth and not merely a re-arranging of the pie. 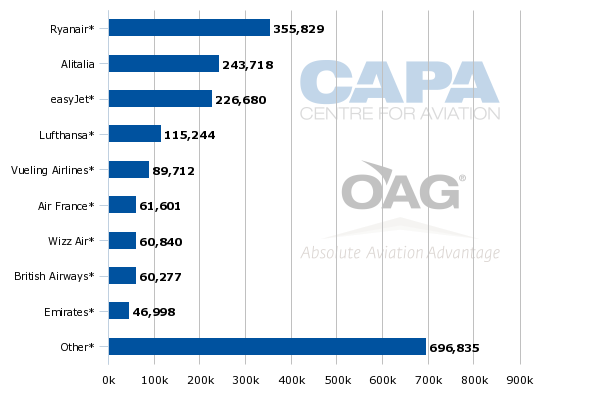 Of other non-European and North American carriers serving Italy, the biggest are planning roughly to maintain or grow capacity. China Eastern will be about 5% larger in Italy in 2015 while Cathay will be 6% larger. Air India will gain a full year's benefit from the growth it put in Italy in 2014. Smaller carriers like Royal Jordanian, MEA, Sri Lankan and Biman will decrease capacity, but they are affected by a range of issues – regional instability, inefficiencies – so that cannot conclusively say Gulf growth is at their expense. Europe's main airlines, which can transport passengers from Italy to markets the Gulf carriers serve, are publishing mixed forecasts for 2015: Lufthansa will shrink by 3% and Air France by 6%, but British Airways will grow 5% and KLM 2%. But only a small part of that traffic would potentially connect to a market served by a Gulf carrier. In late Mar-2015, Emirates (multiple times larger than Etihad or Qatar in Italy) will be the ninth largest carrier in Italy with an approximately 2% share of the market. Gulf-Italy market in 2015: lower fares, Alitalia re-branding – and flying beyond Abu Dhabi? 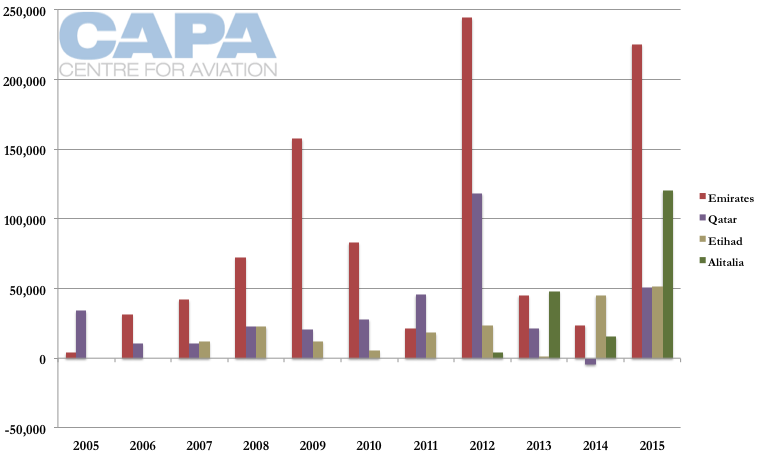 The large growth in the Italy-Gulf market will potentially lead to short-term over-capacity and lower fares, although as it disperses through the wide networks of the respective airlines the outcome is never apparent beforehand. Factoring in accommodation and local costs (to say nothing of value), a short getaway to Southeast Asia may become cheaper than a trip within Europe. The Gulf-Italy story is also heavily about the Alitalia-Etihad relationship, one many (competitors) find contentious but with which the two newlyweds plan to press ahead. Alitalia will re-brand (but keep the Alitalia name), could potentially join Etihad's Partners grouping, use its capacity to fly beyond Abu Dhabi to new markets in conjunction with Etihad, to name but a few strategic developments. Meanwhile, part of the spin off to these arrangements is already making itself known as Etihad promotes itself and Alitalia as "Official Global Airline Carriers of EXPO Milan 2015", something the independent Alitalia could never aspire to. Financially, Alitalia has some big hurdles to leap: it must lower its costs and become competitive with peers. Balancing short-term financial objectives with long-term strategic ones becomes more challenging with so much competition. One upside is that so far airlines from Asia – where most of the additional Italy-Gulf passengers will go to and come from – do not feel compelled to add to the growing competition.